Locations closer to home are becoming a more attractive option for many, and as a native of Melbourne, I set out to investigate a nearby landscape and wildlife photography option that is relatively close to the city. 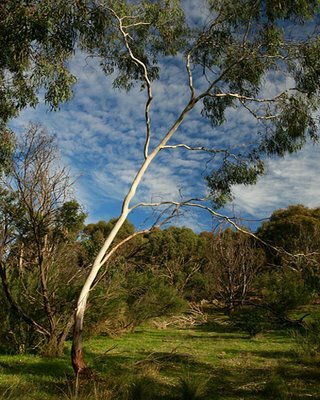 The Organ Pipes National Park, approximately 20 km’s north-west from Melbourne, is a 121 ha park located in the Keilor plains region just off the Calder Highway. The main features of the park are the various rock formations which are dotted throughout and are easily accessed via the well established paths that lead from the car park located adjacent to the Visitor Information Centre. Before setting off it’s a good idea to familiarise yourself with what the park has to offer. The Visitor Information Centre, generally open on weekends, provides a free information sheet which outlines park highlights and general information. There are also large boards depicting the history of the region and development of the park since it was declared in 1972. 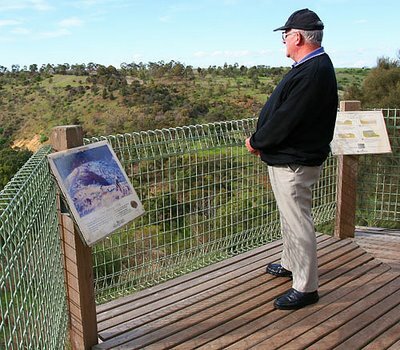 On commencing your journey along the walking track you’ll come across two viewing platforms which provide a magnificent view over the plains that were formed by the massive lava flows from volcanoes around the Sunbury area. Jackson’s Creek has cut a deep valley through the park and this has revealed the splendid rock formations which become evident upon following the path to the bottom of the valley. There are numerous blue wrens to be seen throughout the park and ideally a fast long zoom or fixed length lens will provide the best results. 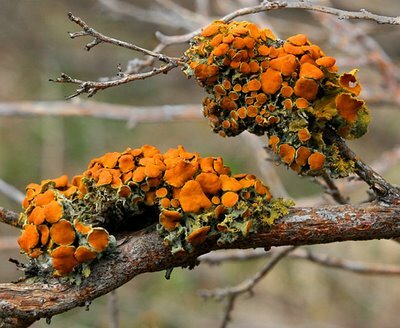 Also, keep an eye out for the various mosses which can be seen growing on the ground and in the trees. A quality macro lens will give the best results, so make sure you take one along if you own one. As you continue along the path towards the Organ Pipes formation you’ll notice the revegetation of the park that is taking place. Much of this work is conducted by a volunteer group called ‘The Friends Of The Organ Pipes’ and their efforts to restore the park are recognised as being one of the most successful restoration projects in Victoria. 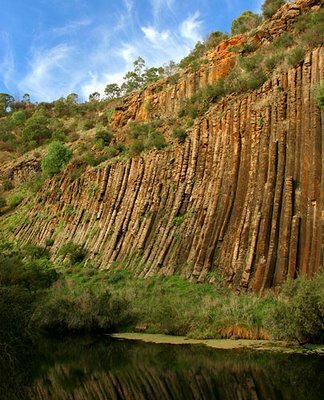 The park gained its name due to the rock formation known as ‘The Organ Pipes’. 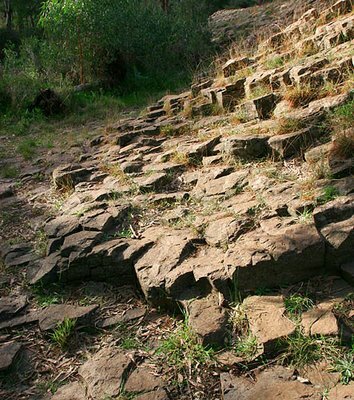 This towering rock feature is a result of a lava flow about a million years ago and the subsequent erosion, caused by the flow of water from Jackson’s Creek, has revealed the large basalt columns. Best time to photograph this is in the early to mid afternoon due to some large nearby trees that cast a shadow on a sunny day. Further along the track you’ll notice some attractive native trees. At last count there were 145 species of native plants recorded within the park. Volunteers have been diligently working towards re-establishing the native trees and shrubs, however it hasn’t been an easy task. 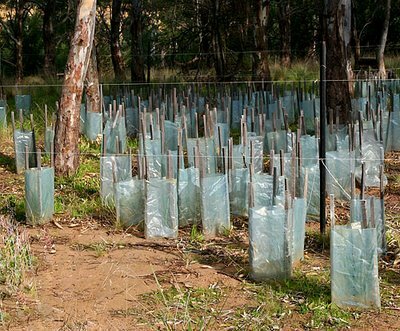 A continual weeding program exists, which contributes substantially to the regeneration. The ‘Tessellated Pavement’ is a sight to behold. This formation is the top of basalt columns that have been filed down by the water of Jackson’s Creek. Extreme caution should be exercised when walking over this feature as it is quite rough in places and can get very slippery after rain. 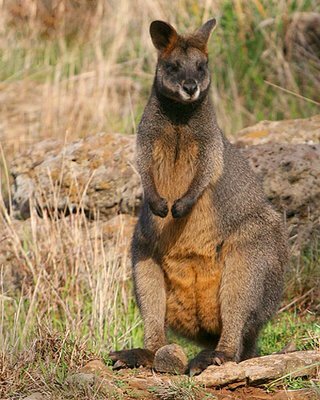 Later in the day after most people have left the park you may be fortunate to spot a wallaby. If you do, move as little as possible and you’ll be able to capture a photograph of one of our native marsupials. The Organ Pipes National Park is open from 8.00am to 4.30pm each day and during summer months closes at 6.00pm on weekends and public holidays. Toilet facilities, picnic tables and barbecue areas are provided for visitors, however you do need to bring your own gas barbecue, as solid fuel fires are not permitted in the park. So, if you’re looking for somewhere close to town for a photographic opportunity, try the Organ Pipes National Park – entry is free. Darren, This is a well put together article with accompaning photographs. Thanks for the information on the Organ Pipes. And to think...Its all free of charge. Darren I have regularly passed the organ pipes national park over the last 20 years on my drives up the calder highway to Mildura. I have always said one day I will stop and have a look and now seeing your photos makes me want to take a day and just go out there and look around and take some pics. Looking forward to further local Melbourne locations. thanks for your comments - much appreciated. kharman, Melbourne has a few hidden treasures right under our noses and with a little investigation on the Parks Victoria website, you'll find numerous opportunities exist for taking photos and having a good ole relaxing few hours. Take a look at the Organ Pipes Park when you get the chance and don't forget to take your camera. Not a bad spot for a picnic too. Do you ever do any photographic work in the Dandenongs in Victoria ? I hear that it's great place for artists of all kinds. Thanks for the info on the church kharman - much appreciated. Anon, I haven't photographed in the Dandenongs for many, many years. I'd like to head up that way again and take photos and put together quite a detailed article. I'll do a little research on the Dandenongs, now that you've mentioned it. I noticed that you mentioned Jacksons creek in Sunbury. If you know the area well, it used to be where the disabled institution Caloola was. I believe it is now a University or TAFE college. The area certainly has a long history, not only beauty, but the horrors of institutions. I followed your web link from your profile on ADPOTD where I noted that you had just joined. Thanks for the informative article and great photos. Can you believe that I've lived only a little way up the Calder (Macedon) and never visited this park although we've meant to several times. Your article has made me keen to do that as soon as we can find a spare few hours one weekend. Thanks for your kind comments regarding my Organ Pipes article and photos. A few hours spent investigating the park is a great outing and you're sure to find a few gems to photograph. ADPOTD is a great site and I'm very glad I joined. Plenty of like-minded people with a passion for their craft. Had a look at your photography on the weblink you provided and you're a very fine photographer indeed. Thoroughly enjoyed looking at your images - terrific stuff. Thanks for visiting my site Brian and glad you feel inspired to visit the Organ Pipes National Park. Darren, Do you conduct tours to the places that you photograph.? You seem to have a good knowledge of Victoria, so I am wondering if this is your occupation. At this stage I don't conduct tours, however it has crossed my mind to do so. Probably down the track I'll be looking at setting up a few things along those lines. I'm open to your suggestions and offers, and if you'd like to make contact via my e-mail on the site I'd be most appreciative. Thought i drop you a line and say....GREAT article. You will certainly go far my friend. You educate yourself so well about the places you visit and you capture the locations essence so well with your photographs and wonderful writing technique. Keep up the great work Darren. Thanks for dropping by once again and offering your words of encouragement. Your work is pretty darn good too I have to say, and you're improving at a rate of knots with both your photography and writing. There's no doubt that words and photographs provide a terrific way to communicate with information hungry readers. It's a pleasure to be able to do it and the advice offered is truly appreciated. Glad you enjoyed the article Sam.